Starting with psychology and ending with horror, Shelter loses its identity quickly and muddles along the wrecks of ideas past. Julianne Moore tries to appear concerned about all the spirited mumbo jumbo, but she is probably just worried about what this mess of a film will do to her career. Psychologist Cara Harding (Moore) does not believe in split personality disorder. Her father Dr. Harding (Jeffrey DeMunn) is also a psychologist, and he introduces Cara to a new patient (Jonathan Rhys Meyers), who definitely appears to be housing two personalities: the meek, wheelchair bound David, and the more aggressive, fully fit Adam. Cara is still skeptical, and delves into Adam's background. She uncovers the story of the real David, a teenager confined to a wheelchair after an accident, and later found tortured and killed. Cara believes that Adam takes on the personality of David as an escape from his unsavoury life. But soon enough, the personality of Wes, a dead music band member, also appears within Adam, complicating Cara's life and diagnosis. As she continues to try and understand how Adam came to be so many people at once, Cara stumbles onto an ancient mystery, a community hiding the secret of soul sheltering, and a maniac of an evil-doer who has been hunting down people for centuries. Shelter does provide a sprinkling of adequate chills, mostly with Cara searching for clues to Adam's origins deep in the inhospitable rural woods and among houses that should be condemned but are occupied by either people or corpses. Moore generates enough magnetism to maintain a vague interest in the proceedings, even as the script detours to the rubbishy neighbourhood of soul collecting and blind old women pulling organs out of patients to cure them of evil. 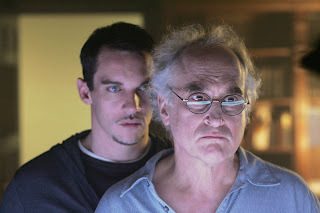 And Jonathan Rhys Meyers does bring a creepy intensity to Adam, a man with plenty to worry about on the inside. Unfortunately, once Shelter abandons psychology and bumps down the road of gruesome murder most foul wrapped up in pseudo religious dogma and an ancient battle against rampant disease, the script by Michael Cooney just lies down and dies. It should be self evident that switching genres halfway through the movie and then half-baking the fundamental premise is a recipe for deflation, but Cooney falls for every trap in the book of over eager imaginations. Co-directors Mans Marlind and Bjorn Stein do little except throw all the old horror camera angles at the screen, and hope that something spooky takes hold. It never does. The ending of Shelter cannot come soon enough, as Adam chases after Cara and her daughter Sam in the rural hinterland, the all-conquering, centuries-spanning evil presence reduced to the ignominy of a cheap chase-the-girls-in-the-woods climax. It's a fittingly disappointing resolution to a film that had some ideas, and promptly scattered them into the winds of confusion.